About … coffee and coding and computers and church and life. 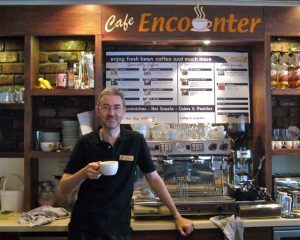 Named in honour of the real Café Encounter for which I was privileged to lead the team that launched it and ran it from June 2010. The café is no more, but the church that spawned it is still running. If you’re looking for Chris try Chris F Carroll at Linked In. Chris, thank you so much for your article on BootCamp drivers for Windows 8. I was struggling to get audio going on my iMac 27″ for a while. Yoir advice was very helpful! MJI don’t think the Church as a whole, is doing anything to adcnvae race relations from a broad societal point of view. I’m sure individual congregations and local church organizations are working to bridge gaps but I don’t think mainstream America has a good view into these efforts. Christianity and the call for humbleness might be a barrier here. We are called to work for the common good, care for and respect our fellow humans, but we are not encouraged to beat our chests when we do. I do think the Church is missing an opportunity to find common ground within the body of believers. But how do we do that? Certainly the basic premise, the foundation of any effort is our faith in Jesus Christ but where do we go from there? I don’t know. I do know that unless we take those first steps and begin talking to our fellow believers with openness and respect, we’ll never find out. Has this comment somehow landed on the wrong blog? Hi!! This blog is way too awesome! I download boot camp drivers form your site. But Apple release OS X 10.8.3 and this updates the boot camp drivers. So, are you going to update your links ? And I also want to know whats the difference between Windows install file and Mac install files (.exe and .dmg). In Apple Support (www.support.apple.com) we can download the Windows installer. So, why only Windows installer why not Mac Installer ? And the mac installer (.dmg) have to download and install by model. The windows installer doesn’t have to download according to model ? Why? Arnold! Sorry I never replied, my apologies. I checked the apple bootcamp driver links recently and I’m pretty sure they haven’t changed. Bear in mind that the drivers are Windows drivers, so a new version of OSX doesn’t change anything. The Mac installer is install-by-model because it contains precisely the hardware-specific stuff – screen keyboard trackpad and so on, so it’s got to be specific to each hardware model. I think Apple’s Windows installer is only for updates for older versions of Windows after you’ve got windows running and it might just be that it contains stuff for several models in one bundle. I’m not aware that Apple have a windows download that allows you to install the drivers in the first place? I like so much your posts and I follow the new entries periodically. Thank you for your time, really this blog is very helpful for me. i have a white iMac core duo ModelID: iMac4,1. There does not seem to be a bootcampESD.pkg that is associated with my model ID. What driver pkg should I use for Win7 dual boot. Hi Chris, I’m afraid I’m not 100% sure that you can do it. Apple haven’t done Win7 drivers for your model, they stopped at WinXP. You could try installing Win7 or Win8 anyway and see if the Windows built-in in drivers on the windows installer are good enough — which they may well be. I did run Win8 myself for a while with no apple drivers. The only problem I had was that the screen brightness and volume keys didn’t do anything, other than that everything else pretty much worked. I’m wondering if the said technique with Bootcamp and BootCampESD.PKG will work on my iMac 10,1 Chinese traditional version.. So far I’ve managed to get to the point of having Windows XP SP2 Chinese installed, but I am still in need for the Mac drivers. Thanks. can you point me the direction where to get bootcampesd.pkg for Windows XP SP2? Thanks. Sorry Andy I was on holiday in August … I’m afraid I haven’t done instructions for XP, but I know a blogsite that has: http://danieltharp.com/weblog/2012/04/how-to-install-windows-xp-sp3-on-mac-osx-lion-and-get-drivers-too/ is the best I know of. I think the problem is that in XP days the BootCamp assistant had the XP drivers bundled in, instead of downloading them — so you need a physical OS X Leopard install CD get the drivers. Thank you immensely for providing the sources for bootcamp drivers for all macs! I don’t know how you did it, but you have provided a tremendous resource for the mac user community. Many times I have installed bootcamp on various macs and for various reasons they have gotten stuck in the middle of the process of downloading drivers. In this case I have an old MacPro 1,1 which will not run Mountain Lion and the old Snow Leopard Bootcamp Assistant doesn’t even have a destination choice to put the drivers and when it wigged out in the middle of the download I thought I was lost. I found your site and I’ve already almost instantly created a driver disk that I now can use to put bootcamp on this old mac. Again, many thanks! You are a lifesaver, Chris! i have i,mac 14.2 where do i find acutal Driver for boot camp ? Superb, what a weblog it is! This webpage provides valuable data to us, keep it up. thank you so much for the greatest description and all the information which brought me really close to a perfect running bootcamp windows 7 professional system. But when all was properly set up and running, I found out, that neither any kind of usb stick nor my simple usb based mouse is running. Both USB Ports are absolutely dead and there is a yellow sign telling me, that the usb controller bus has no driver and it is not possible to install one. Any ideas what is going wrong here? Dead USB Ports is new to me I’m afraid. The next thing I would think of (assuming the USB ports did work under OS X?) is to double check that you got the right bootcamp drivers?